Lou said that funding from this fellowship will enable her to attend more academic conferences. She added that she may also be able to hire a research and teaching assistant as a result. Lou’s most recent research publications include “Horizon Pricing” in the Journal of Financial and Quantitative Analysis and “Short-Horizon Beta or Long-Horizon Alpha?” in the Journal of Portfolio Management. Her current research topics include media reinforcement in international financial markets, and enforcement waves and spillover effects. “I am humbled and grateful to have been selected for this research fellowship,” Haynes, associate professor of management, said. “The fellowship will allow me to boost two of my research projects. Since this research requires Haynes’ team to conduct in-person interviews in a country that scores high on corruption indices, the research stipend and funding will help cover the costs associated with travel. “The second project that the fellowship award will help with is in the area of artificial intelligence,” Haynes continued. “In this project, I investigate the risks, as well as some ethical and moral considerations associated with artificial intelligence.” The fellowship will support the purchase of software needed to analyze data, as well as, again, travel costs for collecting qualitative data. His paper, “The Impact of CFOs’ Incentives and Earnings Management Ethics on their Financial Reporting Decisions: The Mediating Role of Moral Disengagement,” is forthcoming in the Journal of Business Ethics. “It is a privilege to be selected,” Xie, associate professor of finance, said of the fellowship. “I am very grateful for the support and recognition from the college. “I plan to use the fellowship to support some of my travel to conferences where I present my research,” Xie continued. His research in the field of empirical corporate finance includes corporate governance, mergers and acquisitions, boards of directors, executive compensation and more. Xie’s 2007 paper, “Corporate Governance and Acquirer Returns,” was the Journal of Finance’s second-most cited article of that year. In 2017, Wendy Smith, professor of management, and John D’Arcy, associate professor of MIS, were recognized as Deutsch Faculty Fellows. 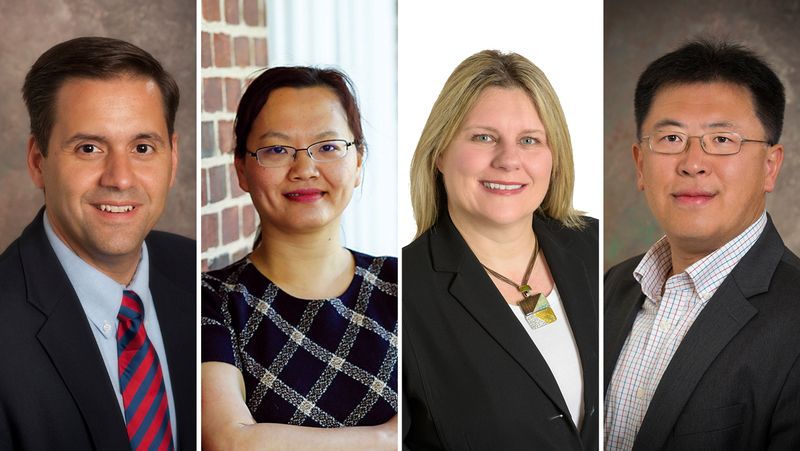 Previously, Xiao Fang, professor of MIS, Adam Fleischhacker, associate professor of operations management, Paul Laux, professor finance, and Harry Wang, professor of MIS, were recognized as JPMorgan Chase Faculty Fellows.